Download "Academic Policies and Procedures"
1 Academic Policies and Procedures Academic policies can be changed at any time by the University of North Texas Health Science Center School of Public Health (UNTHSC-SPH). Students should review the Student Policy Handbook for additional policies and procedures concerning their roles as students. Enrollment of Continuing Students A continuing student is defined as a student who enrolls in one of three consecutive semesters. Example: student enrolls Summer 2011, no enrollment Fall 2011 or Spring 2012, re-enrolls Summer Continuing students do not need to reapply to the UNTHSC-SPH to take classes if they meet all of the following conditions: 1. The student has not received a degree from the UNTHSC since last enrollment; 2. The student does not have any current holds on his or her record (i.e., immunizations or academic); and 3. The student has not attended any other academic institution during his/her absence from the UNTHSC. Students who do not meet these requirements must give a written explanation of the facts surrounding the situation to the UNTHSC-SPH Office of Student and Academic Services (UNTHSC-SPH-OSAS) for consideration. Students who are unsure if they meet all of the above conditions for re-enrollment should contact the UNTHSC-SPH-OSAS at or before the registration period. Re-Admission of Former Students Students who previously have been admitted to the UNTHSC-SPH but have not enrolled during the last three consecutive semesters (i.e., Fall, Spring, Summer) must follow these re-admission procedures: 1. Submit an updated admissions application (contact the UNTHSC-SPH-OSAS to have application ed). 2. Submit transcripts from all colleges attended (if any) since leaving the Health Science Center showing eligibility to re-enroll at each institution. 2 3. Former students who have not enrolled elsewhere since leaving the UNTHSC-SPH and are in good academic standing are required only to submit an admissions application and the application fee. 4. All completed applications are reviewed by the department chair for which the student is re-applying. Admissions decisions will be communicated to the student by the UNTHSC-SPH-OSAS. Non-Degree Admission of Students Admission to the UNTHSC-SPH as a non-degree seeking student may be granted subject to the following provisions: 1. The applicant must meet all of the general admission requirements described in the non-degree section and must meet all application deadlines. 2. The student in this status is required to receive credit in all courses taken and must maintain a minimum cumulative GPA of 3.0 or better. 3. 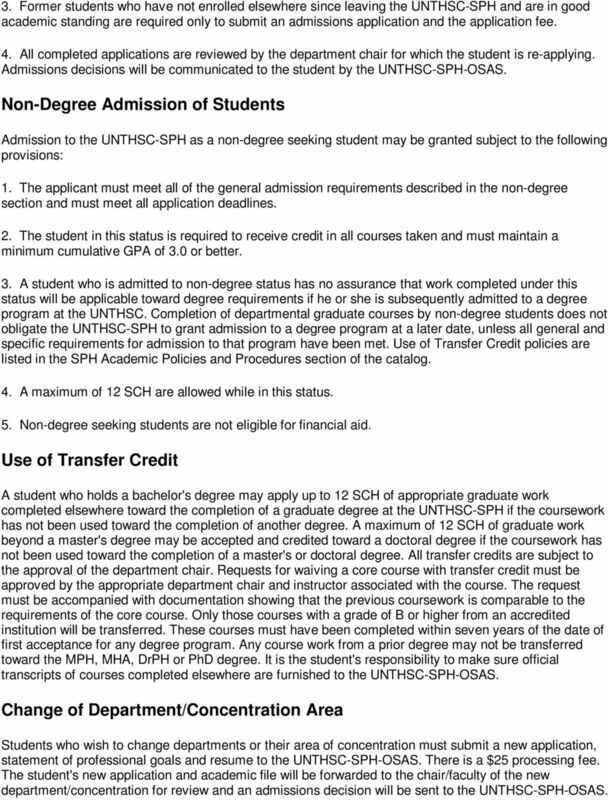 A student who is admitted to non-degree status has no assurance that work completed under this status will be applicable toward degree requirements if he or she is subsequently admitted to a degree program at the UNTHSC. Completion of departmental graduate courses by non-degree students does not obligate the UNTHSC-SPH to grant admission to a degree program at a later date, unless all general and specific requirements for admission to that program have been met. Use of Transfer Credit policies are listed in the SPH Academic Policies and Procedures section of the catalog. 4. A maximum of 12 SCH are allowed while in this status. 5. Non-degree seeking students are not eligible for financial aid. Use of Transfer Credit A student who holds a bachelor's degree may apply up to 12 SCH of appropriate graduate work completed elsewhere toward the completion of a graduate degree at the UNTHSC-SPH if the coursework has not been used toward the completion of another degree. A maximum of 12 SCH of graduate work beyond a master's degree may be accepted and credited toward a doctoral degree if the coursework has not been used toward the completion of a master's or doctoral degree. All transfer credits are subject to the approval of the department chair. Requests for waiving a core course with transfer credit must be approved by the appropriate department chair and instructor associated with the course. The request must be accompanied with documentation showing that the previous coursework is comparable to the requirements of the core course. Only those courses with a grade of B or higher from an accredited institution will be transferred. These courses must have been completed within seven years of the date of first acceptance for any degree program. Any course work from a prior degree may not be transferred toward the MPH, MHA, DrPH or PhD degree. It is the student's responsibility to make sure official transcripts of courses completed elsewhere are furnished to the UNTHSC-SPH-OSAS. Change of Department/Concentration Area Students who wish to change departments or their area of concentration must submit a new application, statement of professional goals and resume to the UNTHSC-SPH-OSAS. There is a $25 processing fee. The student's new application and academic file will be forwarded to the chair/faculty of the new department/concentration for review and an admissions decision will be sent to the UNTHSC-SPH-OSAS. 3 The UNTHSC-SPH-OSAS will then notify the student of the admissions decision. If the student is admitted to the new concentration, the outgoing department will be notified by the UNTHSC-SPH-OSAS. Academic Integrity Cheating and plagiarism are types of academic misconduct for which penalties are described and assessed under the UNTHSC Student Code of Conduct. The term cheating includes, but is not limited to: (1) use of any unauthorized assistance in taking quizzes, tests, or examinations; (2) dependence upon the aid of sources specifically prohibited by the instructor in writing papers, preparing reports, solving problems, or carrying out other assignments; and (3) the acquisition, without permission, of tests or other academic material belonging to a faculty or staff member of the Health Science Center. The term plagiarism includes, but is not limited to, the use, by paraphrase or direct quotation, of the published or unpublished work of another person without full and clear acknowledgement. Plagiarism also includes the unacknowledged use of materials prepared by another person or agency engaged in the selling of term papers or other academic materials. All sources, i.e., internet web pages must be cited appropriately. All students are responsible for making themselves aware of the definitions and implications of academic misconduct. For further information on academic misconduct, penalties and appeal procedures, the student should refer to the Student Handbook available through the UNTHSC Division of Student Affairs. Academic Standing of Student Officers A student in the School of Public Health must be in good academic standing to run for office in any student organization and must remain in good academic standing throughout the term of office, if elected. Appeal/Grievance Process Specific policies and procedures have been established for students seeking to appeal an admissions decision, a grade in a course, or an extension of time to complete a degree. The policies are outlined below: 1. 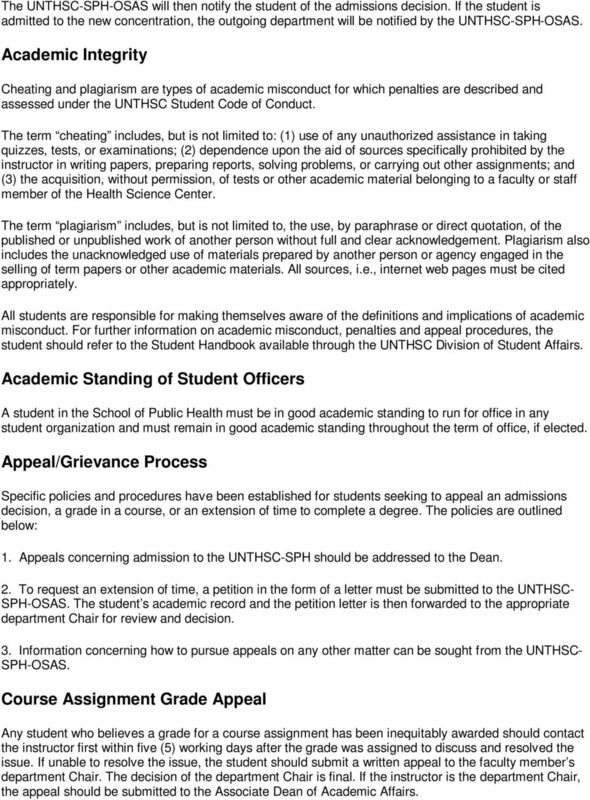 Appeals concerning admission to the UNTHSC-SPH should be addressed to the Dean. 2. To request an extension of time, a petition in the form of a letter must be submitted to the UNTHSC- SPH-OSAS. The student s academic record and the petition letter is then forwarded to the appropriate department Chair for review and decision. 3. Information concerning how to pursue appeals on any other matter can be sought from the UNTHSC- SPH-OSAS. Course Assignment Grade Appeal Any student who believes a grade for a course assignment has been inequitably awarded should contact the instructor first within five (5) working days after the grade was assigned to discuss and resolved the issue. If unable to resolve the issue, the student should submit a written appeal to the faculty member s department Chair. The decision of the department Chair is final. If the instructor is the department Chair, the appeal should be submitted to the Associate Dean of Academic Affairs. 4 Course Grade Appeal Any student who believes a course grade has been inequitably awarded should first contact the instructor who awarded the grade in order to discuss and attempt to resolve the issue. Any instructor no longer associated with the UNTHSC at the time of the appeal will be represented in these proceedings by the department Chair over the concentration in question. The student who is unable to resolve the differences with the instructor has five (5) working days following the first class day of the subsequent semester to file a written appeal with the appropriate department Chair. If the instructor is the department Chair, the appeal should be submitted to the Associate Dean of Academic Affairs, who will act as a substitute for the department Chair. 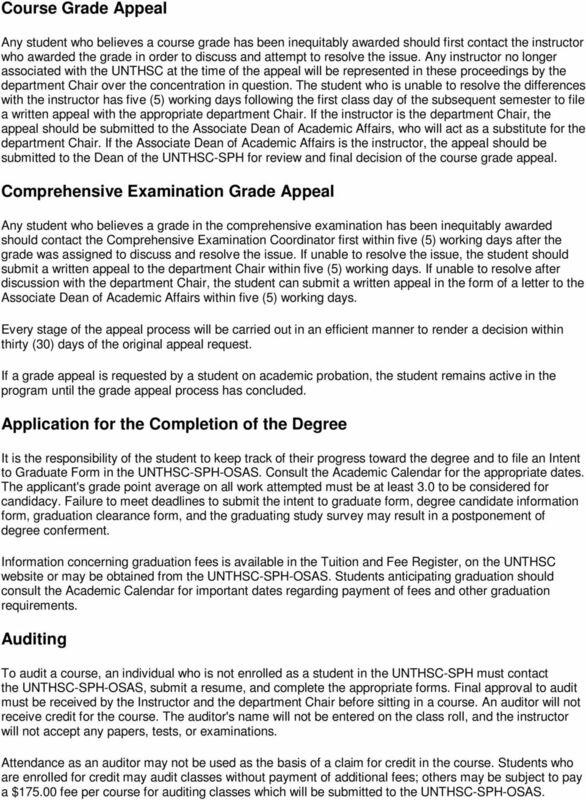 If the Associate Dean of Academic Affairs is the instructor, the appeal should be submitted to the Dean of the UNTHSC-SPH for review and final decision of the course grade appeal. Comprehensive Examination Grade Appeal Any student who believes a grade in the comprehensive examination has been inequitably awarded should contact the Comprehensive Examination Coordinator first within five (5) working days after the grade was assigned to discuss and resolve the issue. If unable to resolve the issue, the student should submit a written appeal to the department Chair within five (5) working days. If unable to resolve after discussion with the department Chair, the student can submit a written appeal in the form of a letter to the Associate Dean of Academic Affairs within five (5) working days. Every stage of the appeal process will be carried out in an efficient manner to render a decision within thirty (30) days of the original appeal request. If a grade appeal is requested by a student on academic probation, the student remains active in the program until the grade appeal process has concluded. Application for the Completion of the Degree It is the responsibility of the student to keep track of their progress toward the degree and to file an Intent to Graduate Form in the UNTHSC-SPH-OSAS. Consult the Academic Calendar for the appropriate dates. The applicant's grade point average on all work attempted must be at least 3.0 to be considered for candidacy. Failure to meet deadlines to submit the intent to graduate form, degree candidate information form, graduation clearance form, and the graduating study survey may result in a postponement of degree conferment. Information concerning graduation fees is available in the Tuition and Fee Register, on the UNTHSC website or may be obtained from the UNTHSC-SPH-OSAS. Students anticipating graduation should consult the Academic Calendar for important dates regarding payment of fees and other graduation requirements. Auditing To audit a course, an individual who is not enrolled as a student in the UNTHSC-SPH must contact the UNTHSC-SPH-OSAS, submit a resume, and complete the appropriate forms. Final approval to audit must be received by the Instructor and the department Chair before sitting in a course. An auditor will not receive credit for the course. The auditor's name will not be entered on the class roll, and the instructor will not accept any papers, tests, or examinations. Attendance as an auditor may not be used as the basis of a claim for credit in the course. Students who are enrolled for credit may audit classes without payment of additional fees; others may be subject to pay a $ fee per course for auditing classes which will be submitted to the UNTHSC-SPH-OSAS. 6 UNTHSC. Failure to secure the required permission for concurrent enrollment prior to registration at the second institution may cause the UNTHSC to refuse degree credit for the work taken elsewhere. Course Offerings Individual courses are subject to change or withdrawal at any time and may not be offered each semester of every year. Any course may be cancelled from current offerings if the number of registrants is too small to justify conducting the course. Full-time Enrollment A student must enroll for nine semester hours for the fall or spring semester to be considered full-time for that semester. Enrollment in a total of six semester hours is considered full-time for the summer. 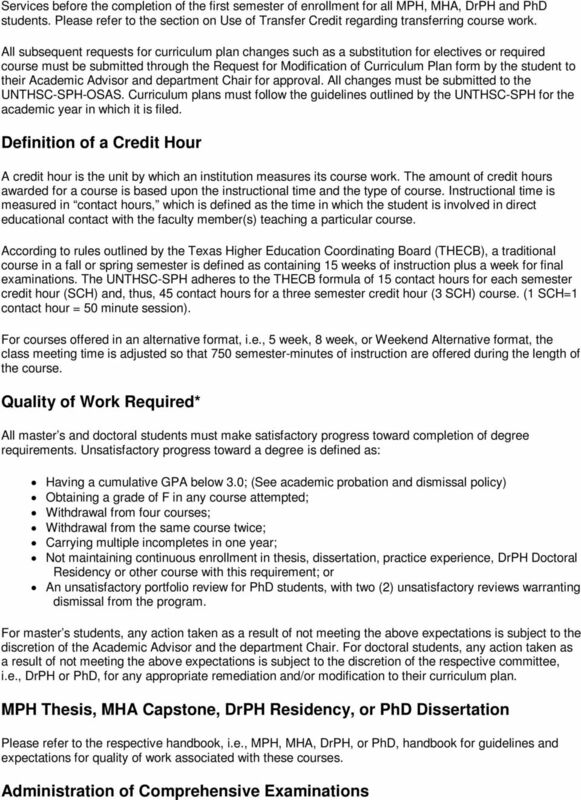 When a student is enrolled in a doctoral dissertation or residency, a master s practice experience, internship or thesis, the student will be considered full-time if enrolled in three semester credit hours. Students are responsible for meeting enrollment requirements for federal or state financial aid purposes. Academic Probation and Dismissal A student who fails to achieve the required cumulative average of 3.0 GPA (B average) on all course work in a semester will be placed on academic probation for the subsequent semester. If the student achieves a 3.0 semester GPA in the subsequent semester, but the cumulative GPA is still below 3.0, the student will remain on academic probation. The student will be removed from academic probation when the 3.0 cumulative GPA is achieved. A student who is placed on academic probation who does not receive either a semester or a cumulative 3.0 GPA during the following semester of probation will be dismissed from the UNTHSC-SPH. 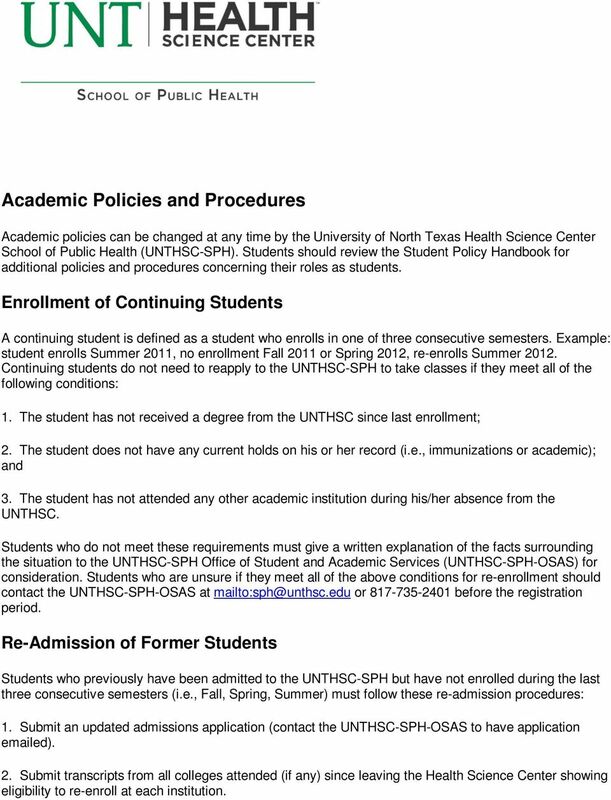 Upon dismissal, the student is not permitted to return to a degree program at the UNTHSC-SPH. Appeals to a dismissal must be made to the Dean of the UNTHSC-SPH. The student remains active in the program until the appeal process has concluded. 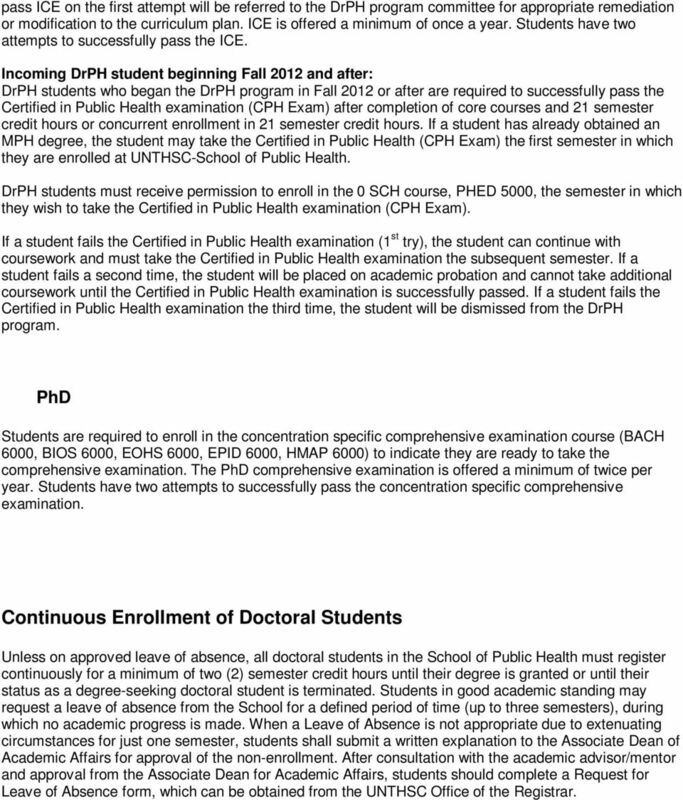 To graduate from UNTHSC-SPH, a student must have a minimum 3.0 cumulative GPA. Repeating Courses If a grade of F is received in a required course, the course must be repeated. Students are not obligated to repeat a course if a grade of F is obtained in an elective. Students may repeat any course twice (maximum enrollment of 3 times). The best grade obtained will be used in the calculation of the GPA. If a grade of "W" (withdrawal) is recorded on the student's transcript, this is considered one of the three allowable attempts at successfully completing the course. Withdrawal Limit Students may withdraw from a maximum of four (4) courses throughout the completion of their degree requirements. A master s student with four (4) withdrawals will be reviewed by their Academic Advisor and the concentration department Chair. Doctoral students with four (4) withdrawals will be reviewed by their Academic Advisor and their respective committee, i.e., DrPh or PhD, for any appropriate remediation and/or modification to their curriculum plan. 10 pass ICE on the first attempt will be referred to the DrPH program committee for appropriate remediation or modification to the curriculum plan. ICE is offered a minimum of once a year. Students have two attempts to successfully pass the ICE. Incoming DrPH student beginning Fall 2012 and after: DrPH students who began the DrPH program in Fall 2012 or after are required to successfully pass the Certified in Public Health examination (CPH Exam) after completion of core courses and 21 semester credit hours or concurrent enrollment in 21 semester credit hours. 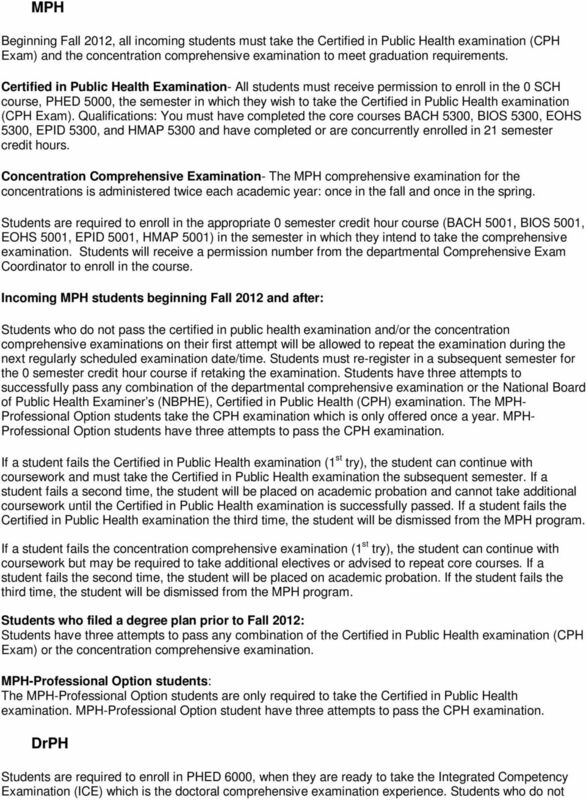 If a student has already obtained an MPH degree, the student may take the Certified in Public Health (CPH Exam) the first semester in which they are enrolled at UNTHSC-School of Public Health. DrPH students must receive permission to enroll in the 0 SCH course, PHED 5000, the semester in which they wish to take the Certified in Public Health examination (CPH Exam). If a student fails the Certified in Public Health examination (1 st try), the student can continue with coursework and must take the Certified in Public Health examination the subsequent semester. If a student fails a second time, the student will be placed on academic probation and cannot take additional coursework until the Certified in Public Health examination is successfully passed. If a student fails the Certified in Public Health examination the third time, the student will be dismissed from the DrPH program. PhD Students are required to enroll in the concentration specific comprehensive examination course (BACH 6000, BIOS 6000, EOHS 6000, EPID 6000, HMAP 6000) to indicate they are ready to take the comprehensive examination. The PhD comprehensive examination is offered a minimum of twice per year. Students have two attempts to successfully pass the concentration specific comprehensive examination. 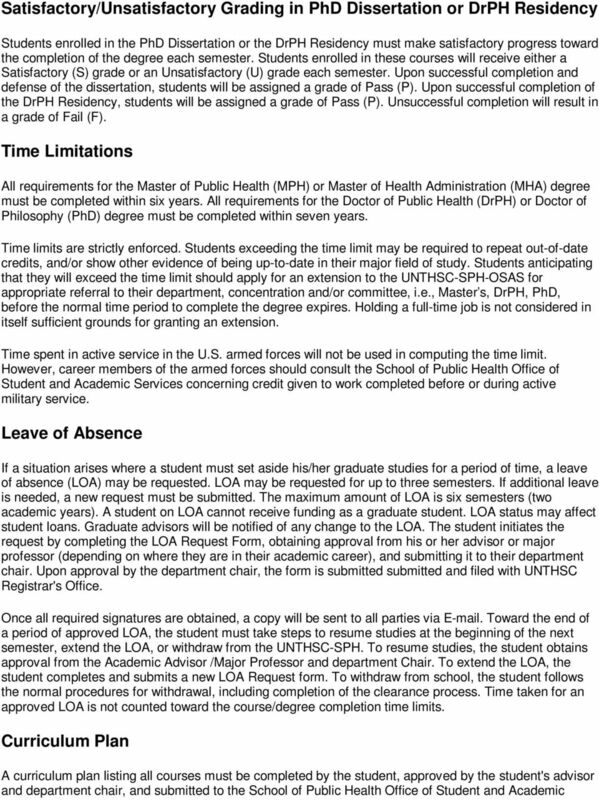 Continuous Enrollment of Doctoral Students Unless on approved leave of absence, all doctoral students in the School of Public Health must register continuously for a minimum of two (2) semester credit hours until their degree is granted or until their status as a degree-seeking doctoral student is terminated. 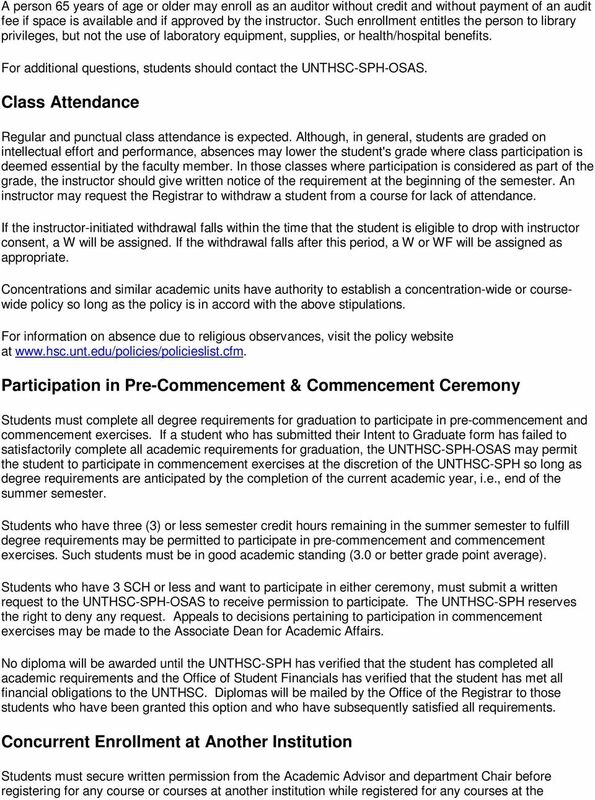 Students in good academic standing may request a leave of absence from the School for a defined period of time (up to three semesters), during which no academic progress is made. When a Leave of Absence is not appropriate due to extenuating circumstances for just one semester, students shall submit a written explanation to the Associate Dean of Academic Affairs for approval of the non-enrollment. After consultation with the academic advisor/mentor and approval from the Associate Dean for Academic Affairs, students should complete a Request for Leave of Absence form, which can be obtained from the UNTHSC Office of the Registrar. Florida A&M University Graduate Policies and Procedures Each graduate program has a different mission, and some programs may have requirements additional to or different from those in the Graduate School. The Masters of Arts Program in Politics The Wilf Family Department of Politics Graduate School of Arts & Science New York University. Graduate Student Handbook for the following programs: Master of Engineering MSE ES Software Engineering MSE ES Enterprise Systems Innovation and Management Global Outreach and Extended Education Ira A. Some courses are graded on a pass/fail basis. Grades of P, W and WP are not calculated into the GPA. 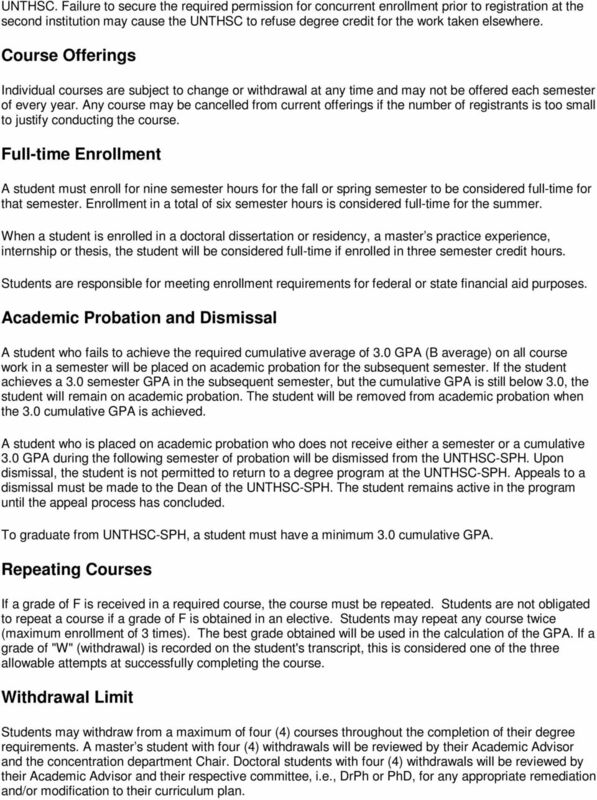 Please review current Graduate College policies and procedures. Course registration Students may register for courses of study and drop or add courses only with the approval of the MLS director. Graduate School Policies and Procedures Mission Statement: The mission of the Graduate School is to promote excellence in graduate education and to facilitate educational opportunities for graduate students. PhD Program Details. 1. Residency Requirements. 2. Registration Requirements. For students matriculating after Sept 1, 2004. STATE UNIVERSITY OF NEW YORK AT ALBANY Department of Economics Doctor of Philosophy Program Guidelines: May 2013 I. Admission Each application is evaluated on its individual merits by the Economics Department.